Corbett County is budget deluxe resort/hotel in Jim Corbett National Park, nestled in a mango orchard and is an ideal getaway to experience the wilderness of nature at Corbett Park by staying close to nature. The serene environment and tranquil environs of the places soothes the visitors. The charm of the place is in the serene environment that it provides to its guest, one thing they always long for in their cities. If you are on a lookout for a relaxing break away from your grinding work schedules Corbett County is the place to be in. The resort is a home away from home where you can enjoy vacation in seclusion. 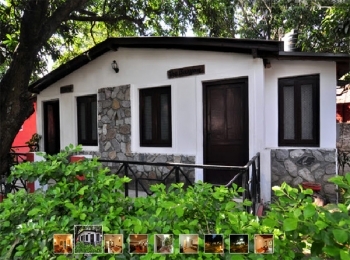 Corbett County Resort is located along the Jim Corbett National Park in Corbett. The nearest railway station is at Ramnagar, some 20 km away. New Delhi is 270 km away from the resort, while Ranikhet is the closest hill station around 85 km away. The Resort offers 14 comfortable and well appointed rooms with standard facilities like fans, AC, hot and cold water with attached washrooms. The rooms are classified as Cooler Standard and AC Deluxe. 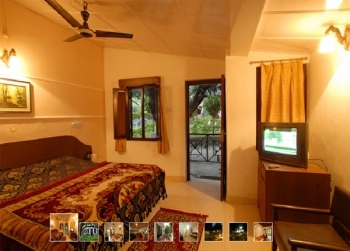 The rooms are spacious with carpeted floors, double bed and a wardrobe. The restaurant in Corbett County serves authentic Indian cusines that will certainly be your place of interest after an adventurous day out in the Jungle. A wholesome delicious meal can be had in our cozy dining hall, however we don’t mind serving your meals next to bonfire or in the lawn as you please, because its you own home close to nature.